If you have a bottle of Hardywood Park Craft Brewery Raspberry Stout, put a stickie note on it. Gold medal winner, 2014 Great American Beer Festival, American-Style Fruit Beer category. The Richmond brewery, and Devils Backbone Brewing Co., gave Virginia a few feathers to put in its cap in the nation’s most prestigious craft beer competition Saturday. For Hardywood, it represented the first medal of any sort that a Richmond brewery has brought home from the GABF (at least according to the memory and research of this veteran beer writer). For Devils Backbone, which was named the nation’s Best Mid-Size Brewing Company and Mid-Size Company Brewer of the Year — as well as winning four medals for individual beers — it was continued validation of its status as one of the country’s top craft beer operations. Before production skyrocketed by opening a facility just outside Lexington (thus moving it into a different category), the “base camp” operation in Nellysford won consecutive awards for best small brewpub and small brewpub brewer. Brian Nelson, head brewer for Hardywood, said he and co-owners Eric McKay and Patrick Murtaugh decided the Raspberry Stout had the best chances of five beers entered. “Eric does a lot of the judging for the competition, and he said that was going to probably be one of the ones. And he was right,” Nelson said. “We were just looking for some medals, honestly, but a gold medal with the raspberry in the fruit beer category was awesome,” Nelson said. Winning any medal is awesome indeed. More than 5,500 beers were judged, and 35 percent of those were first-time entrants, mirroring meteoric growth in the craft beer sector. The nation now has more than 3,000 breweries, 99 percent of which are craft breweries. “If you come up and get a medal, you should be pumped,” said Chris Swersey, competition coordinator for the Brewers Association, before announcing the awards. Dave Warwick, head brewer of Three Notch’d Brewing Co. in Charlottesville, was definitely pumped at winning a bronze in the Irish-Style Red Ale category for Hydraulion Red. The Devils Backbone crew had a pleasantly intense moment during the awards. While they were in line to have their photo taken for winning their first medal, a bronze for Old Virginia Dark, Swersey announced two more awards — a gold for its Schwartz Bier and a bronze for Turbo Cougar. That’s not the first awkward moment for excellence Devils Backbone has experienced. At August’s Virginia Craft Brewers Cup competition, the brewery swept all three top awards for Best of Show. Three Notch’d Brewing Co. of Charlottesville won a bronze medal in its first competition at the Great American Beer Festival. 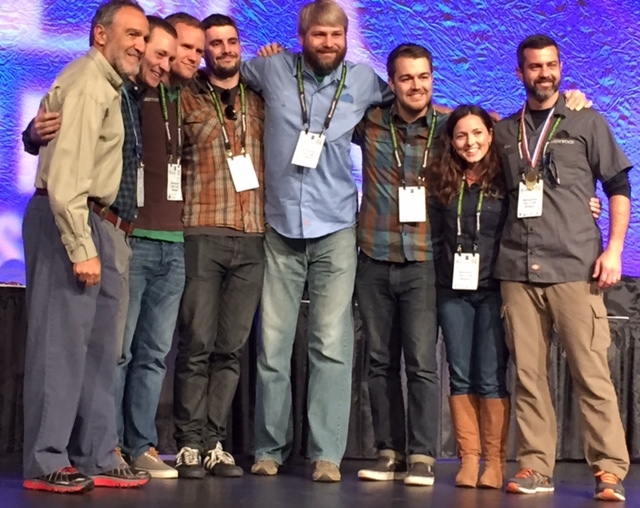 But winning the GABF top award after moving to a different category felt especially good, Humphreys said. The brewery, which started 2014 targeting production of 40,000 to 50,000 barrels this year, is now the state’s largest craft brewery. “It’s very affirming to know that, at this scale, the beer is just as high-quality as the day we started,” Humphreys said. “It really just tells us that we’re doing what we need to be doing,” added Nate Olewine, head brewer at the “outpost” facility in Rockbridge County. Despite the achievements, Devils Backbone’s four medals (a bronze as well for Alt Bier in the German-style Alt category) were fewer than last year’s six. And Virginia totaled fewer as well, down from 14 in 2013 to seven this year. In addition to those already mention, Capitol City Brewing Co. in Arlington won silver for its Amber Waves Ale. Winning medals is only one measure of a beer’s merit, though, because entries must meet strict style guidelines. In these days of increased innovation and creativity, toeing the line is not always the goal. For example, two of the most popular breweries at the festival — Florida’s Funky Buddha and Iowa’s Toppling Goliath — were not among medal winners. “We did not plan to win any medals. Our beers are meant to be unique, different and not be true to style,” said Neil Burton, owner of Strangeways Brewing. Strangeways and Lickinghole Creek Craft Brewery joined Hardywood in giving Richmond a strong presence on the festival floor. Those who do seek medals find the goal increasingly challenging. As Nelson spoke, festival-goers eager to sample medal-winning beers lined up at the Hardywood station. Call me a hometown cheerleader, but I was glad to get in line and share the glow of the gold. For complete results of the Great American Beer Festival 2014 competition, go to www.greatamericanbeerfestival.com/the-competition/winners/.